Heat the oil, put in the onions, carrots, garlic and ginger powder and cook. 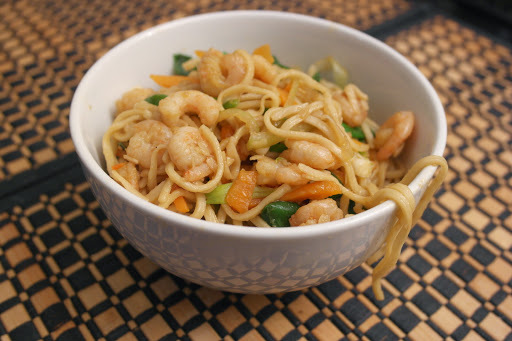 Add the prawns and cook for a few minutes, then add the cooked noodles spring onions, pepper and soy sauce. Mix all the ingredients well and taste. Add more soy sauce and salt if necessary or till you get your desired taste. I finally added my chili and garlic stir fry sauce because I love the sweet taste. you do not have to if you don’t want to.